California native Sage the Gemini might not be a name most people are familiar with. But the 21 year old Dominic Wynn Woods is sitting on millions from two songs that are on heavy rotation in the clubs. Sage’s first single Red Nose peaked at number 14 on Billboard’s R&B Charts selling over 600,000 copies. The single was accompanied by a dance that has generated over 135 variations on youtube. On iTunes year end lsit of most downloads Red Nose ranks higher than Drake’s ‘Started From the Bottom”. The song garnered national attention and Sage landed several tours with artist like Machine Gun Kelly, Meek Mill, Wiz Khalifa, Migos and French Montana. He’s currently on the sold out tour “Levels 2″ generating over $55,000 per night. Dominic came from humble beginnings in Fairfield California. He doesn’t boast or brag about selling cocaine or drugs. His parents helped him get his first car he bought on Craigslist when he was 17 years old. It was a 95′ Camarro he explained in an interview with Power 106 FM. The car was constantly in the shop and he took it for it’s last ride just three months after he purchased it. The Camarro’s engine overheated and Sage was catching the bus for a minute until his career took off. 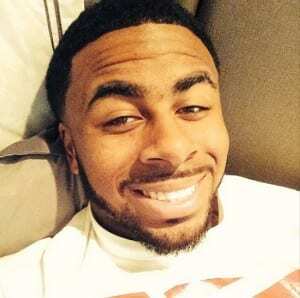 Sage the Gemini grew up listening to a wide array of music. He sights Chris Brown, Andre 3000 and Usher as his major musical influences and his top 3 artist. Sage came up with the idea for Red Nose while he was playing with his pitbull. He was in the process of recording a mainstream booty shaking record but didn’t want to use the same lyrics. His pitbull was pulling on a rope which made him come up with the idea for “Red Nose”. His music is heavily influenced by the Bay area sound. He looks up to artist like E-40 who reached out to him to do a verse on his album. Before getting into the booth Sage had done small plays in local theater. He starred in a campaign called “You Are Not Alone” to raise awareness for gang violence. He also worked in PacSun when he dropped his first single. He paid for the music video with only $2,000 and Nikon HD camera he and a few friends put together. After several weeks on Youtube the video for Red Nose garnered over 100,000 views and sparked a dance movement. Shortly after that several labels including Def Jam, Columbia, Epic Records, Atlantic and even Bad Boy reached out offering a deals worth a total of $15 million. He had two singles on the charts Gas Pedal and Red Nose on Billboard’s Top 100 at the same time. He chose to sign to Universal Republic which is home to Angel Haze, Kelly Rowland, the late Amy Winehouse, Akon, Ariana Grande and Birdman.